This building was named for Dr. Philip L. Halenbeck, a St. Cloud physician. 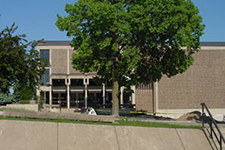 Halenbeck Hall was built in 1965 and remodeled in 1980. The facility provides health, physical education and recreation opportunities with a main gym seating 7,500, a swimming pool, diving pool, two small gyms, a 200 meter track, racquetball courts, wrestling room, weight room and dance studio. From 5th Avenue turn east on 11th Street S. Follow 11th Street to 4th Avenue, turn left into the parking lot. Halenbeck Hall is on the right. The nearest public parking is the 9th Street/4th Avenue pay lot or the 12th Street/3rd Avenue metered T Lot. Street parking may also be available.